Goofy is a beloved Disney character created back in 1932. Over the years, children and adults have fallen in love with this dopey goofball as he stumbled his way through all types of chaos and problems. He was the star of many animated shorts, including the Everyman years in the 1950s. 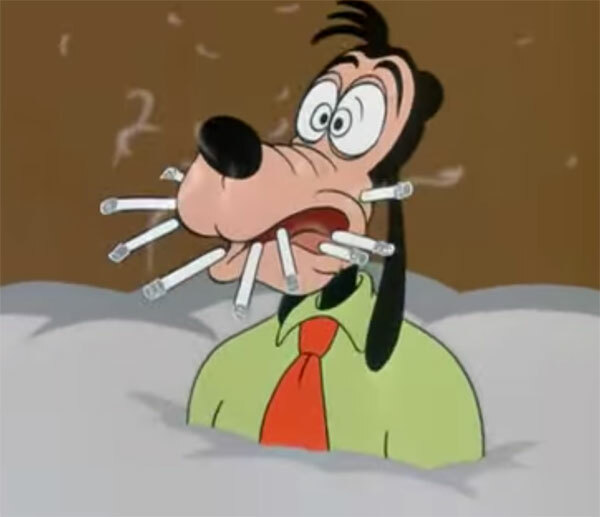 That series reimagined Goofy as a family man named George Geef who dealt with everyday issues like raising children, dieting, and even quitting smoking. In the end, after running around the city looking for something–anything–to relieve his craving, he finally gets a cigar and the short ends with upbeat music as if now everything is great again. This is so unexpected from Disney, who announced last year that they would ban smoking in all their PG-13 and under films. But times have changed, and maybe some things are meant to stay in the vault. Watch this short plus others in the DVD collection Walt Disney Treasures: The Complete Goofy.